AUTOSHIP (regular repeat automatic orders at wholesale) . Note: The autoship and retail products are the same. You may mix and match retail and autoship products in the same order. Two (2) Autoship orders qualify for lower autoship pricing. We only require two autoship orders to qualify for the lower price. The Autoship interval defaults to monthly but the interval can be set or changed at any number of days, weeks or months up to 6 months between shipments. Although the default interval for autoship is monthly, there is a "leave us a note" box at the end of the order process where you may ask for a different interval between shipments. YOU MAY SET YOUR OWN INTERVAL in days, weeks or months up to 6 months, and still qualify for the reduced automatic shipping price. Shipping intervals and ship dates are easy to change and you can always contact us to make changes to your autoship. The longest interval to qualify for the lower price is one shipment every 6 months. Autoships are EASY to cancel. You can now immediately STOP an autoship from My Account after reauthenticating. Cancel your automatic vitamin C reorders online, by phone or by email. ONLINE by selecting the Cancel Autoship psuedo-product listed in our online store and ordering it like a regular purchase. And after the minimum commitment of 2 purchases, you may stop the autoship at any time without penalty. Our current policy is that autoship customers may purchase additional quantities of the same products at the same autoship price. This policy is subject to change without notice. Our Vitamin C is Vitamin C Foundation Approved®. Click on a information Box below for more detailed information. USA Customers: We offer a complete, unconditional money-back 30-day guarantee for one-time retail shipments to the United States . Simply return the product for a full refund. Overseas customers purchase AT THEIR OWN RISK. Note to first-time Overseas customers: Large orders will not be accepted. First-time customers are generally limited to no more than 3 jars. The overseas shipping charge may calculated before you order by putting items in your shopping cart, and clicking on the "Estimate Shipping" link. We do not usually accept returns on overseas orders. Any problems are handled on a case by case basis. . Call us to discuss special circumstances. Please make sure that your return shipment includes your name and phone number. Tell a friend and while they are on a Cardio-C autoship, your Cardio-C autoship is discounted. Naperville Nov 2013: We do not share or sell customer information. Period. Did you recently receive a spam/marketing email? We want you to know that it was not from or authorized by the Vitamin C Foundation. 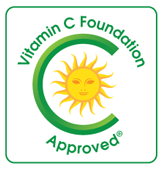 If in doubt about what products to purchase, look for our trademarked Vitamin C Foundation Approved® Seal on the label.